If you want to step up your digital marketing in China, then you must adapt to its ever-changing atmosphere. The Chinese digital space enjoyed a significant growth last year. 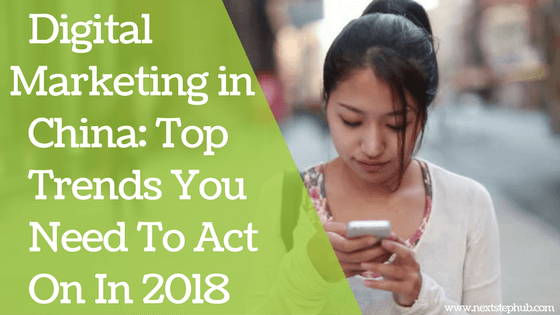 Different marketing trends took the country by storm, and we can expect the same thing to happen in 2018. According to Statista, China is poised to be the world’s largest digital market by 2018. This means that the country’s business landscape will be more vibrant, promising, and of course, competitive. To stand out, you have to understand the new trends and apply them to your marketing tactics. So this week on Five Tips Tuesday, we’ll give you the latest digital marketing trends in China. Discover the marketing trends that are set to conquer China this year. Learn more about WeChat’s latest feature. Get tips that will help you rank in Chinese search engine results. Be part of China’s biggest digital marketing summit this year. And lastly, get the awesome book that will help you navigate the Chinese market. Just like in the West, the needs and interests of the Chinese customers are also changing. That’s why it’s vital for you to know the new marketing trends and practices. Being updated will help you in understanding Chinese consumers better. Read this article and discover the trends that are set to conquer China. Tourism boards are now eager to reach Chinese outbound tourist through WeChat. Still, it’s challenging for them to create content that fits their audience. Luckily, Tencent started to work with the U.S and European tourism organizations. In fact, it just announced a suite of advertising tools that will aid U.S tourism boards to connect with Chinese travelers on WeChat. So how will this affect the Chinese digital marketing scene? Find out here. Trends come and go, but SEO is here to stay. If you’re planning to leverage this tool in China, then you must be aware that the Chinese search engine differs from the West. Check out this blog and learn how you can build an SEO strategy that will fit the Chinese digital ecosystem. Do you want to understand China’s digital marketing space better and widen your network? Then you should check out the 6th China Digital Marketing Innovation Summit 2018. This big event will highlight important topics, such as the future of digital marketing in China, social marketing, mobile marketing for B2B scenarios, and many more. It will also feature notable speakers from leading companies like Tencent Group, GE, BMW, Sephora, and Starbucks. Learn more about the digital marketing summit here. Navigating the Chinese business landscape can be challenging sometimes. Fortunately, there are “speed-read” books like ‘The 1 Hour China Book’ that can help you understand the country’s market better. This national bestseller from Jonathan Woetzel and Jeffrey Towson simplifies China in a smart and elegant way. It also cites the trends that are happening in China, and how these changes are impacting the rest of the world. Do you have other tips that will help entrepreneurs improve their digital marketing in China? Tell us below!